In the heart of Paris, in a quiet area between Daumesnil and Nation to touch the green castle (promenade planted in the direction of Bastille). Unusual apartment, located on the 2nd and last floor in a building type "holiday bungalow" with terrace. 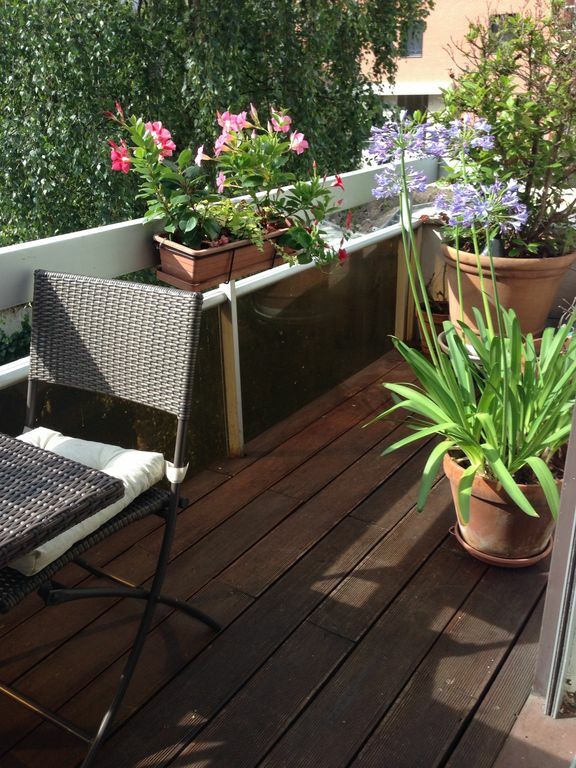 Very beautiful 2 rooms of 55 m² (3 beds 1 separate bedroom with a double bed + 1 sleeping for 1 person) spacious, quiet, very sunny, bright. Good as new. Exceptional view on a park and garden. Double exposure: view on a park side stay / living room and garden view room side. FOR LONG-TERM RATE PLEASE CONTACT ME. Secure building with 2 access codes / digicode. Beds are made on arrival, linen (sheets, towels ..) is provided and included. The apartment has a great location right across from the Metro. No lugging of suitcases through the streets required. There are 2 bistros/brasseries in short walking distance and a Carrefour to buy groceries. The apartment was pretty and comfortable and had a nice outdoor patio. My only suggestion would be to have a second fan because August in Paris was terribly hot, without air conditioning. I highly recommend the apartment and I would rent it again personally. In our planning for our first visit to France we quite were worried that something could go wrong to spoil the first impression. After a careful study we selected this apartment based on VRBO information. And we were really lucky to trust the reviews. The majority of facts listed in the VRBO review appeared to be correct, and even better than expected from the text. So, our stay appeared very memorable and enjoyable, despite the hot weather and the leg trauma I had a few months before the trip. So, if you like to get a full experience of living in Paris at a moderate price, that's the right place. Ourselves, we would like to visit this place again, if an opportunity arises. There are many clear and unique advantages for this apartment 1) High quatily-to-price ratio 2) Metro station Bel Air, just 60 m away from the door, with convenient access to major Paris attractions. 3) Villa-like location, surrounded by a garden and blocked from outside noises with street-level buildings. 4) Lots of space, easy to accommodate a family with kids. 5) Location in a safe, typical middle-class Paris district, with several restaurants and fresh produce markets at easy access. 6) Nice, friendly and helpful owner. 6) 2 opposite side balconies, which guarantee fresh air and high level of comfort during the summer heat. So if you are not inclined to go outside, just take you timer and relax in a sofa! As for disadvantages, we can list only few of them: 1) electric stove not strong enough for cooking 2). Lack of freezing compartment in the fridge (bye-bye, the ice cream). 3) Lack of towel hooks in the bathroom. We really enjoyed the details of the decor, and the care that had been lavished on this gem of an apartment. Very conveniently across the street from the Metro in a bustling little neighborhood. We took in the football match at a bistro bar down the street. We were able to rest and refuel for the next day of summery Paris. We would definitely recommend this place. The apartment was clean and inviting. We loved staying in your apartment. We felt very much at home. We prefer to stay in apartments, not hotel rooms. Love have my morning coffee first thing in the morning without getting dressed and finding a cafe. It was such a quiet neighborhood away from the constant sirens that you hear in big cities all day and all night. The balcony over looking the garden was wonderful for that first sip of coffee. We really liked staying at this apartment. It was clean, quiet and comfortable. It was very close to a subway station. We had a bit of a language barrier when we checked in, but it wasn't a problem. The apartment is nicely decorated and had everything we needed. Line 8 to Daumesnil access to the major opera stores. Line 1 and RER A to Disneyland direction Nation. very nice neighborhood. Close to shops (supermarkets, bakeries, restaurants ...). A touch of green belt (green walk from Bastille). Near Place de la Bastille (very touristy and lively neighborhood with its bars and restaurants), the Place des Vosges, the Marais Park and Zoo de Vincennes.